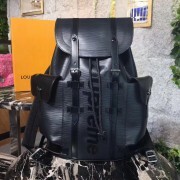 41.0 x 48.0 x 13.0 cm ( length x height x width ) - Ostrich skin - Adju..
- 17x13x8 CM - crafted of camouflage "Supreme" - front zipped pocket, - two leather and nylon log..
louis vuitton supreme backpack Size: 33x13x45 CM The Louis Vuitton x Supreme Christopher backp..
Are you looking for high quality louis vuitton backpacks but don't know where to get them? You don't need to worry it anymore because you are already in the right place. 1. All images are taken from actual items, you can compare them from the authentic items. 2. We tried our best to attach youtube videos at the product pages. 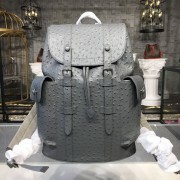 Some of them are unbox videos, the others are reviews for louis vuitton backpacks, but all of them are about authentic items. Watch them carefully, and educate yourself to tell the difference between the authentic and our replicas. In our opinion, palm springs mini, josh, montsouris, christopher pm is a good start.